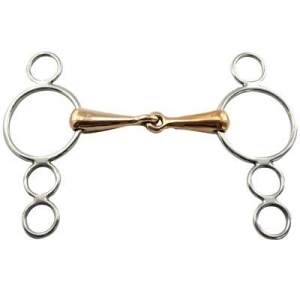 The 3 Ring Continental Solid Copper Mouth Jointed Gag Bit that we offer is a Top Quality item for your Horse. This product is made of copper in the mouth which will help with the hores salivation. While our main focus at Horse Tack Now is top quality Horse Bits, we proudly offer other premium quality horse tack items. If you are in need of Copper Mouth Jointed Gag Bits this item is just what you need. The solid copper makes this one of our best value bits available.